Today is a great day for Disney movie fans as Disney has just released TWO movies on Blu-ray! 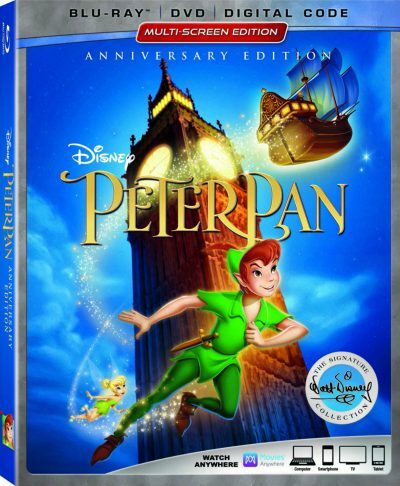 First off, in celebration of its 65th anniversary, Peter Pan is joining the Walt Disney Signature Collection on Blu-ray and is also now available on Digital and Movies Anywhere. With a little faith, trust and pixie dust, every member of the family will let their imagination soar on this epic adventure to Never Land, sparkling with legendary animation, extraordinary music and both all-new and classic bonus features. In Peter Pan, fantastic adventures await the Darling children – Wendy, John and Michael – when Peter Pan, the hero of their stories, whisks them away to the magical world of Never Land. After flying with Peter and the delightfully impish Tinker Bell past the “second star to the right and straight on till morning,” they explore the enchanted island and Peter’s secret hideout with the Lost Boys, and leap into high-flying battles with swashbuckling pirates and the infamous villain Captain Hook. 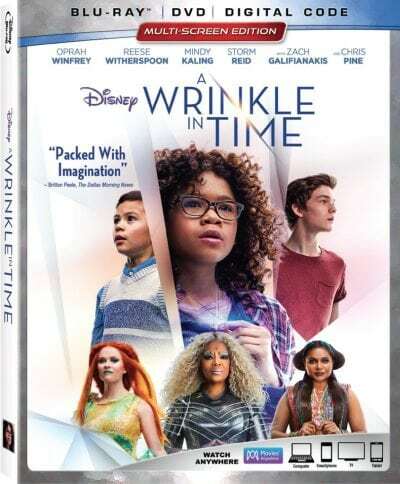 Also, Disney’s A Wrinkle in Time is now available on Blu-ray as well as Digital and Movies Anywhere. In this film, Oprah Winfrey, Reese Witherspoon, Mindy Kaling and breakout star Storm Reid ­­take viewers on an extraordinary journey of self-discovery, then behind the scenes through exciting extras! The stunning story of an ordinary girl’s extraordinary adventure through time and space offers exhilarating entertainment and positive messages for the whole family – encouraging self-confidence, inclusion and pushing imagination to the next level. 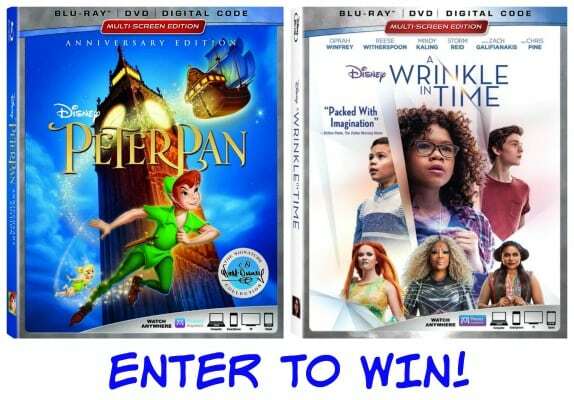 Now you can enter to win both Peter Pan and A Wrinkle in Time on Blu-ray! Reader Giveaway: One lucky Jinxy Kids reader will win both Peter Pan and A Wrinkle in Time on Blu-ray! To enter, complete the entry form below by 11:59 pm ET on 6/25/18. Good luck! Tinkerbell is my favorite character from Peter Pan and I don’t have a favorite character from A Wrinkle in Time. I will watch these with my niece and nephew if I win. I’d love to watch these with my daughter! I would love to watch both of these with my kids! I will be watching these movies with my daughter if I win. Thanks for the giveaway! “Let us know which character from these movies is your favorite and/or who will be watching these movies with you if you win.” I like Nana, because she is a good doggy! This would be a great movie for my daughters sleep over birthday party so I would be watching it with a bunch of girls. Wendy fro Peter Pan is my favorite character! I can’t wait to watch these movies with my kids. We can have family movie night. I really enjoyed Wrinkle in Time! The story of Meg and it’s positive message came at the right time for me. I will be watching these with my grandsons. I like Tinker Bell. I’ll be watching Peter Pan with my boyfriend it’s his fave Disney movie! I would be watching these movies with my son. the crocidile is my fave. I would love watching these with my grandson. Tinker bell is my favorite. My daughter would love these movies! I love Peter. I used to watch this movie on REPEAT with my niece when she was younger and I would babysit. It is one of our favorite memories! 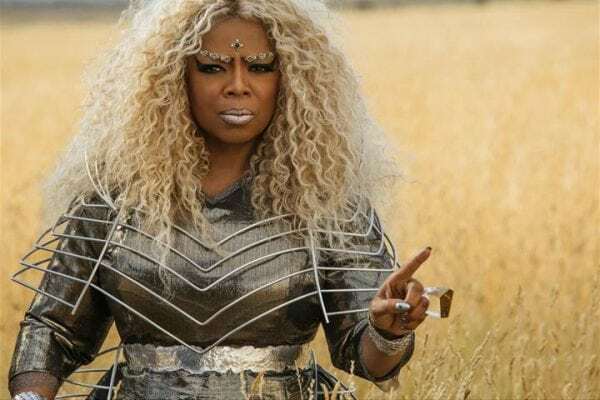 I havent gotten to see Wrinkle in time but anything that Disney makes and also has Oprah in it has to be great! I watched Peter Pan at a cousins house growing up. I loved Tinkerbell. I know that my son would love Tinker Bell and that my nieces would love watching Wrinkle in Time. I want to watch them both with all of my family we all love Disney movies ! I would watch these movies with my nieces. I would watch these with my daughters. Tinkerbell has always been my fave! I would watch these with my niece and nephews. I’d watch with my mom and grandma! Peter Pan. My husband and my kids. 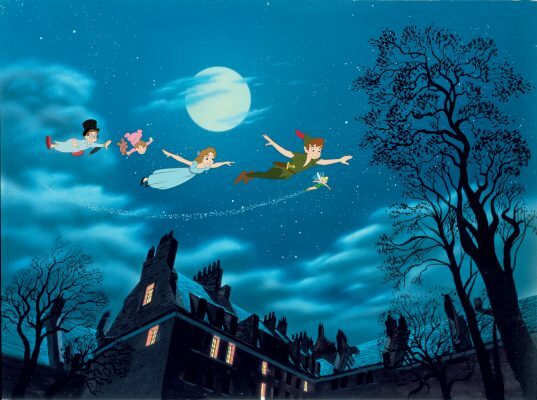 I enjoy Peter Pan, it was my daughter’s favorite when she was younger. My favorite character is Tinkerbell and my favorite from A Wrinkle is Time is Charles Wallace Murry! I plan to watch with my husband and kids! I’ll be watching this with my daughter! Thank so much for the chance! I like Tinkerbell. My son’s have never seen this movie so I would like to watch it with them. Tinker Bell has always been my favorite. I’ll be watching with my nieces and nephew. I will be watching this with my daughter. Honestly I have never seen A Wrinkle in Time so I’m looking forward to seeing it if I win. I’ve always been a fan of Tinkerbell. I’d probably watch with my daughter. 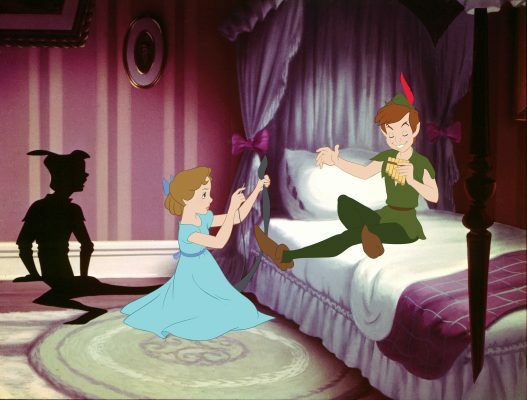 We love Peter Pan! I’ve read the Disney story book to my kids so many times! Tinkerbell is my favorite character from Peter Pan and Mrs. Whatsit as Reese Witherspoon from Wrinkle in Time. My daughter will be watching these movies with me if I win. I like all of the characters and I will be watching this with my family. Peter Pan is my favorite and I will be watching this with my nieces. I never read the Wrinkle in Time book so I don’t have a favorite character, but I know my niece and nephew will love watching this movie!! Tinkerbell is my favorite from Peter Pan. Can’t wait to watch A Wrinkle in Time to see who will be my favorite! I’m flying out to VA to see my grandchildren next month so can’t wait to watch these movies with them! Peter Pan is my favorite character from Peter Pan. I have never seen A Wrinkle in Time yet so I do not have a favorite character from that movie. I will watch these movies with my two daughters. My favorite character from these movies is ‘Wendy’ from ‘Peter Pan’. I’ll be watching these movies with my whole family! I will be watching the movies with my kids. I would love to watch these movies with my son! I like Wendy from Peter Pan! I love Peter Pan of course and I will be watching these wonderful movies with my niece. I will be watching these with my family. I would watch these with my nieces. Peter is my favorite character from Peter Pan. I have not seen A Wrinkle In Time yet, so no favorite character. Our family will enjoy watching both of these films. Thank you for the chance to win. I would watch these with my nieces and nephews! 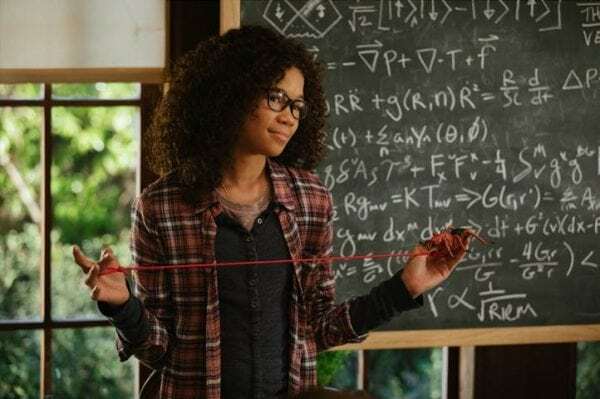 And I do love Meg in A Wrinkle in Time. I would watch these movies with my son and daughter. They would both enjoy them! With children, glad their are 2 movies and love the blu-ray. I would watch these DVD’s with my daughter. I like Smee in Peter Pan! My favorite character is Wendy, of course!! I think my daughter would enjoy watching these with me. Meg was always my favorite in the books. I’d be watching this with my daughter. Tinkerbell from Peter Pan is my favorite character. I always loved her as a child. tinkerbell is my favorite from peter pan. i haven’t seen wrinkle in time yet. I would watch these with my kids. I loved Peter Pan as a kid, and I hope my kids would enjoy it as well. I love Peter Pan. I will be watching with my nephew. I’m a big Peter Pan fan and would love to share these movies with my son. I love Peter Pan!! I would watch these with my kids. Peter Pan and would watch with my daughter. I like Meg in Wrinkle and Wendy in Peter Pan. I would watch these with my son. I would watch with my niece and newphew. I will be watching these movies with my daughters if I win….awesome movies!! My favorite is Peter Pan, I’ve never seen or read Wrinkle in Time so I wouldn’t know. I’d watch these with my daughter. I would be watching these both with my children, my favorite character from Peter Pan is Wendy and I haven’t seen Wrinkle in Time yet. I havent seen Wrinkle in Time but it is one of my favorite books… Peter Pan is a classic! I’ll be watching with my daughter and my nephew! Our granddaughter will be watching these movies with us. Tinker Bell is my favorite. I will be watching the movies with my niece and nephew. I’d watch with my kids! I would watch these with my niece. I would love to watch these movies with my nephew. I always liked Wendy. I would watch these with my littles! Wendy is my favorite! I would definitely watch this with my daughter. She’s currently picked to read A Wrinkle in Time for her summer book! Tinkerbell is my favorite. I would watch these with my daughter. She is grown now, but growing up, I always dressed her as Tinkerbell for Halloween when she was little. I will be watching these with my sons and husband. Tinkerbell is my favorite. I will be watching this movie with my grandchild.